A trial evaluated the effectiveness of macrophytes, Azolla caroliniana (AAC) and Lemna minor (ALM) as a culture media for microalgae Ankistrodesmus gracilis, and their possible use as feed ingredient for ornamental fish. 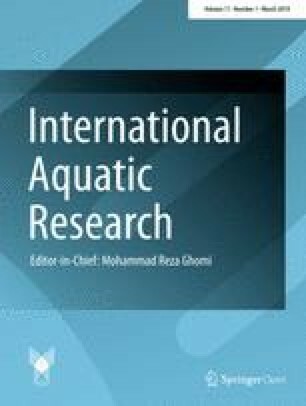 Water quality in all aquariums was adequate for the growth of Xiphophorus maculatus, whilst pH acidity in inert diet (ID) treatment and high content of P in AAC diet treatment did not interfere in fish development. Growth performance parameters were higher (P < 0.05) in ALM diet treatment, except condition factor and feed conversion ratio, with similar rates (P > 0.05) in all diet treatments. Survival was above 75% and total length was similar (P > 0.05) for ID and AAC diet treatments. Lipid levels ranged between 7 and 11%, and was enough to maintain high survival rates (> 80%) and weight gain above 0.42 g to mixed diet (AAC and ALM) and 0.27 g to inert diet. Ankistrodesmus gracilis and macrophytes as a culture media are useful as functional ingredients, because biomass may be incorporated with the food supplement for X. maculatus to enhance nutrition quality and to maintain high growth performance. Although A. caroliniana and L. minor may be used with culture media, L. minor provided the best results to microalgae growth biomass and ornamental fish. Trade in ornamental fish has been on the increase during the last decades. The color of the animal is the main purchase factor, since it is associated with the quality of feed for the increase of growth performance. Microalgae are known as excellent live feed due to their pigments that improve color, survival, and growth rates. Its potential as feed supplements is due to high levels of fatty acids, polysaccharides, vitamins, minerals, and essential amino acids and pigments (such as chlorophyll and carotenoids). They may also be used as partial replacement for conventional proteins (Madeira et al. 2017). Fish may be maintained and developed by live feed through large-scale production of microalgae at high costs, especially with regard to culture media. Several research works have underscored the use of alternative culture media, such as inorganic fertilizers (El-Nabris 2012; Ramaraj et al. 2015) or the employment of organic wastes retrieved from aquaculture, such as macrophytes (Sipaúba-Tavares et al. 2009, 2018). The above-mentioned alternative culture media decrease production costs by maintaining the nutritional biomass of algal biomass. The latter is a crucial factor for the production of high-quality fish feed. Employing certain species of microalgae in fish diet, Sathasivam et al. (2017) reported price reduction and increase of nutritional value in fish. Although several species of microalgae are used in aquaculture, a few studies deal with Ankistrodesmus gracilis. Microalga is well accepted by fish larvae, and may be easily grown in the laboratory due to size, shape, thickness of cell walls, nutritional value, and fast growth (Sipaúba-Tavares and Rocha 1993). Macrophytes, such as microalgae, are primary producers and remove from water and sediment (rooted macrophytes), the nutrients necessary for their development, mainly nitrogen and phosphorus. They are rich in minerals, fibers, and amino acids. Lemna and Azolla are macrophytes that occupy an important place as food components in fish feeding due to their highly protein value around 20.4% and 21.9%, respectively (Mandal et al. 2010). High fiber contents of the whole macrophyte meal have put great limitations to fish food despite their high nutritive value (Sotolu and Sule 2011). However, aquatic plants may be used through technologies that make possible their rich potential in nitrogen and phosphorus, basic nutrients for the growth of microalgae. Aquatic plants may be duly employed as culture medium for the growth of A. gracilis. Consequently, the joint use of the two components (microalgae and macrophytes) provides the production of a proper feed. In fact, both have large profiles of macro- and micro-nutrients, vitamins, antioxidants, and essential acids that improve growth, weight gain, and immune response of some aquatic organisms. The use of macrophyte as culture medium for microalga production will play an important role as food and will directly influence the growth of ornamental fish. Platy fish are omnivorous: they mainly eat plants, algae, insects, and small crustaceans. They are popular aquarium fish, subject to important ornamental fisheries in aquaculture, and have been used as research models as early as the 1930s (Pitts and Volkoff 2017). Most successfully reared ornamental fish are omnivores. In fact, the species have best adapted to captivity conditions, including available nutrition (Abowei and Ekubo 2011). Current study evaluates the effectiveness of macrophytes, Azolla caroliniana and Lemna minor as culture media for microalgae Ankistrodesmus gracilis production, and their potential use as feed ingredients for ornamental fish. Strain (005CH) of microalgae Ankistrodesmus gracilis was batch-cultured at 22 ± 2 °C and exposed to light at 60 µmol m−2 s−1, on a 24-h light cycle. Macrophytes Azolla caroliniana (AAC) and Lemna minor (ALM) were used as culture media. Culture medium with different macrophytes has already been discussed by Sipaúba-Tavares et al. (2009, 2018). The macrophytes were chosen due to their great availability and abundance on the site. The effects of macrophyte culture media on the growth of A. gracilis were simultaneously investigated during a 28-day cultivation period, by experiments under similar growth conditions. Approximately 5-kg wet weight of each plant was washed gently under tap water to remove detritus and epiphytes. The material was sun-dried and then dried in an oven at 60°C, overnight. Dried plants were homogenized in a grinder and boiled in distilled water for 1 h. The hot extract was filtered and autoclaved at 120 °C during 20 min. A 70 mL sample was collected, cooled, and diluted with distilled water up to 1.4 L, when 2.5 mL NPK were added. The experiment started with 10 mL at a density of 0.75 × 105 cells mL−1 containing CHU12 medium. When cultures reached the last exponential growth phase (7th day), approximately 250 mL, at a density of 2 × 105 cells mL−1, were added to the 2 L NPK medium. After the 7 day exponential growth phase, the culture at a density of 4.4 × 105 cells mL−1 was transferred to sterilized 2-L recipients containing the two different macrophytes media (AAC = Azolla caroliniana and ALM = Lemna minor). Vitamin B complex was added to the alternative culture media at the rate of 0.02 g L−1 (7 mg—B1; 7 mg—B2; 5 mg—B6; 33 µg—B12) plus biotin (0.1 mg L−1) to induce microalga growth. Continuous illumination was applied and the macrophytes media were employed to grow the microalgae cultures in 2 L. Cell growth in all treatments was evaluated in triplicate (n = 3) for 28 days. Assays were performed with Xiphophorus maculatus (GUNTHER 1866) juveniles (45 days old) commonly known as platy fish, which were acquired from the Ornamental Fish Laboratory (21°15′19″S and 48°19′21″W), Brazil. Prior to the start of the experiment, fish were fed on Artemia for 2 weeks to acclimatize them to experimental facilities. The fish were randomly divided into 15 experimental aquariums (three treatments and five replicates) with 15 fish stocked in each experimental unit. The experiment was carried out during 90 days. Initial weight of fish in all treatments was 0.30 ± 0.004 g, with initial length at 2.7 ± 0.1 cm. Mean fish weight at the start and end of the experiment was determined. Weight gain and total length of fish were measured one by one. The following formulae were used to assess growth performance: condition factor (k) = 100 × (W/L3) where: W = live body weight (g) and L = total body length (cm); specific growth rate (SGR%) was calculated by ([ln(final weight) − ln (initial weight)/number of days] × 100), following Kestmons and Stalmans (1992); survival (%) = [number of surviving fish/total number of fish stocked] × 100; weight gain (g) = final mean fish weight − initial mean fish weight and feed conversion ratio (FCA) = amount of feed supplied/weight gain. A control, inert diet (ID) was formulated to contain 32% crude protein, featuring 20,362 J g−1 gross energy based on feed stuff rates reported by Tamaru and Ako (1999). Microalgae biomass in each culture medium designates as: AAC with Ankistrodesmus gracilis microalgae cultured in Azolla caroliniana medium and ALM with A. gracilis microalgae cultured in Lemna minor medium. Two different formulated diets added dried microalgae biomass culture in macrophytes (AAC and ALM) culture media to the inert diet containing 47.06 g kg−1 (AAC) and 45.27 g kg−1 (ALM). Fishmeal was included in diets to ensure palatability. Table 1 shows formulation of the diets. The ingredients tested were ground in a hammer mill, mixed, moistened, and pelleted in a meat grinder. The pellets were dried for 24 h, and fractionated and sieved to obtain a diameter of 0.005–0.05 mm. Triplicate 1-mL aliquots were removed daily from the microalgae culture and 2 × 1 μL sub-samples were used for cell quantification by a Neubauer hemocytometer. Growth rate (k) was calculated by formula k = (3.322/t2 − t1 × log N2/N1) (t = time; N = number of cells; subscripts denote rates at different times) (Guillard 1973). Doubling time was calculated from results obtained from growth rate, with formula Td = 1 k−1 (Td = duplication time, 1 k−1 = days per division) (Guillard 1973). Microalgae biomass was harvested, centrifuged, and lyophilized for the analysis of proteins and lipids (AOAC 1990). Chlorophyll-a was extracted with alcohol 90% and quantified at 663 nm and 750 nm (Nusch 1980). Analyses of macro-nutrients (N, P, K, Ca, and Mg) of culture media (without microalgae) and plants followed methodology by Bataglia et al. (1983). The ornamental fish water parameters of each experimental aquarium were performed weekly at 08:00 h, during 90 days. Water temperature, dissolved oxygen, conductivity, and pH were measured in situ with a multi-sensor Horiba U-10. Total phosphorus and total inorganic nitrogen were quantified by spectrophotometry following Golterman et al. (1978) and Koroleff (1976). The analysis contents of diet treatments were dry matter, ash, crude protein, crude fiber, ether extract, nitrogen-free extract, and gross energy (AOAC 1990). All data underwent one-way analysis of variance (ANOVA) with Statistica 8.0 package, to test the effects of culture media and experimental diets (Statsoft 2007). Tukey’s test was applied when differences between culture media occurred. Differences were considered significant at P < 0.05. All experiments were carried out in triplicate for microalgae and in five replicate for fish. Cell growth rate of Ankistrodesmus gracilis was higher in LM culture medium and reached maximum cell density, at 473 × 105 cells mL−1, on the 25th day. In the case of AAC culture medium, maximum cell density was almost half, with 292 × 105 cells mL−1, on the 23th day. Ankistrodesmus gracilis on AAC culture medium featured lower cell density as from the 7th day when compared to ALM culture medium (Fig. 1). Best results for production parameters for A. gracilis culture in macrophytes media were obtained in ALM culture medium, except chlorophyll-a and protein with similar density (P > 0.05) in the two macrophyte media. The fast doubling time in ALM culture medium (5.4 days) may be due to higher growth rate (k = 0.26) when compared to that of the other culture medium. Lipid levels were below 13% of dry biomass and were higher (P < 0.05) in ALM culture medium (Table 2). The two plants feature high macro-nutrients rates. Nitrogen and P were higher in L. minor in the culture medium and plant, whilst K and Ca were higher in A. caroliniana plant and culture medium. 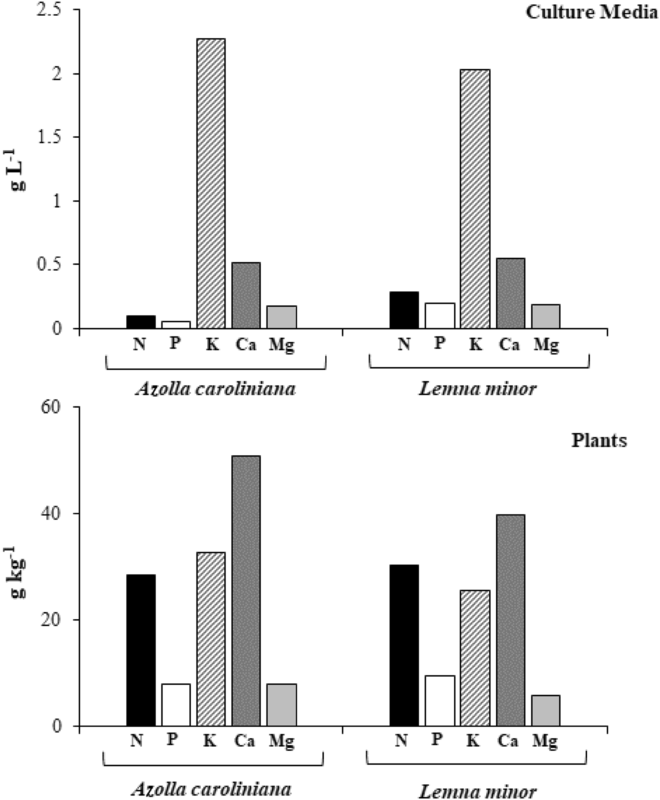 Magnesium was higher in A. caroliniana plant and L. minor in the culture medium. All nutrients in the culture media were lower than in the plant (Fig. 2). Relative concentrations of dry matter in inert diet treatment and mixed diet treatments were above 94%. Ether extract and gross energy were similar in all diet treatments. Crude fiber, crude protein, and nitrogen-free extract were higher in ALM and AAC, while ash content was high in ID treatment (Table 3). Growth performance parameters were higher (P < 0.05) in ALM diet treatment, except condition factor and feed conversion ratio, with similar (P > 0.05) rates in all diet treatments. Survival was above 75% and total length was similar (P > 0.05) for ID and AAC diet treatments. The use of dried microalgae biomass cultured in macrophyte culture media as food supplement for X. maculatus showed positive results, since the growth performance, in general, was higher (P < 0.05) in these treatments (Table 4). Controlled conditions in the laboratory were appropriate for the assay, since results of water-quality variables were similar (P > 0.05) in the different diet treatments, except pH which was acidic in the ID diet treatment, and P, which was higher in AAC diet treatment. Total inorganic nitrogen contents were higher (> 1.2 g L−1) and total phosphorus ranged between 6.7 and 19.2 mg L−1 in all diet treatments. Due to constant oxygenation in the aquariums, dissolved oxygen was above 4 mg L−1, whilst conductivity was below 61.5 µS cm−1 (Table 5). Mixed diet treatments (AAC and ALM) supplemented by algae influenced the growth rates of X. maculatus. Diet treatment with ALM provided the best results in fish growth. However, when compared to ID diet treatments with mixed diet, results for the growth performance of X. maculatus were better in the diet supplemented by algae (macrophytes medium). Mandal et al. (2010) showed that 20% of Salvinia cucullata power resulted in better growth of rohu (Labeo rohita) than 20–80% of conventional feedstuff. Protein levels of A. gracilis in the two macrophyte media ranged between 22 and 48% dry biomass. However, A. gracilis contained all essential amino acids, particularly leucine, valine, and isoleucine (Sipaúba-Tavares and Pereira 2008). The protein levels found in current study were within the range established for microalgae due to the high nitrogen levels that improve protein levels and decrease lipid levels. The nutrition value of microalgae is highly variable. In current study, the protein levels in the culture media were enough to maintain X. maculatus. Chong et al. (2004) observed that feeding of female X. helleri with 20% dietary protein might cause a lower growth rate. Regarding AAC and ALM diets for X. maculatus, the specific growth rate was higher in these dietary treatments than in inert diet. The same occurred with nitrogen-free extract and protein, mainly in AAC dietary treatment. Mixed diets promote high food consumption and growth due to protein and nitrogen-free extract components that trigger growth in X. helleri (James and Sampath 2004). Poor-specific growth rate in fish fed on ID diet treatment suggests that non-conventional food, such as microalgae culture with macrophyte media (AAC and ALM), is suitable for X. maculatus juveniles. Microalgae use lipids as energy source or in the formation of cell membranes. The percentage of lipid content per dry biomass of microalgae may range between 1.55 and 75%, depending on the culture medium (D’Alessandro and Antoniosi-Filho 2016). In current study, A. gracilis cultured in macrophytes media lies within this range and it is similar to inert diet. Interactions between dietary protein and lipid influence specific growth rate. Excess dietary lipid may decrease growth rate due to high levels of dietary energy (Ling et al. 2006). Lipid levels in current study ranged between 7 and 11%, which is sufficient for high survival rate (> 80%) and weighs gain above 0.42 g for mixed diet (AAC and ALM) and 0.27 g for inert diet. At present, scanty information on lipid requirements for X. maculatus is available. However, 8–16% dietary lipids levels with 20% and 30% protein levels diets have significant improved X. helleri growth performance (Ling et al. 2006). Nutrients had higher rates in L. minor plant and culture medium, except K. However, N and P in the plants were higher in LM than in AC. The above may have occurred, because A. gracilis had the best cell growth in ALM culture medium when compared to AAC medium. Potassium is an important nutrient for the metabolism of microalgae and probably influenced the growth performance of X. maculatus. In fact, final weight, weight gain, specific growth rate, and survival were higher in the dietary treatment with microalgae (AAC and ALM). High levels of Ca in plants and K in culture media improved the growth of A. gracilis. Similar levels of chlorophyll-a in both culture media were influenced by Ca, Mg and N in plants and culture media. Concentrations of N and P sources are very important, and affect other factors in the growth of aquatic organism. Phosphorus is commonly supplemented in the diet feed, since it is essential in growth, bone mineralization, and carbohydrate metabolism (Velasco-Santamaría and Corredor-Santamaría 2011). Microalgae are not considered an essential feed source, since great amounts of biomass are required. However, even in small amounts, they have improved the weight, number of eggs, and reproductive performance of fish (Kovac et al. 2013). Water quality in all aquariums was adequate for the growth of X. maculatus, and pH acidity in ID diet treatment and high content of P in AAC diet treatment did not interfere in fish development. Ground or diluted macrophytes in diets as culture medium for microalgae improved the nutritional conditions of diet provided to fish. A better digestibility occurred, since fiber rates in aquatic plants were dissolved in the culture medium. The procedure aggregated the nutritional values of the two components as primary producers that retrieve from the environment the nutrients required for their development. In fact, they trigger adequate growth performance and high survival rates for X. maculatus. Natural components in fish diet are a tool that should be employed in aquaculture. Besides reducing feed costs, it provides protein with high nutritional rates involving carotenoids, vitamins, minerals, energy, carbohydrates, proteins, lipids, and others. Consequently, the employment of organic items, such as macrophytes, which are actually biological residues and develop intensely in sub-tropical fish farms, is highly effective in the feed of ornamental fish such as X. maculatus. Ankistrodesmus gracilis and macrophytes as a culture media are useful as functional ingredients, since the biomass may be incorporated with food supplement for X. maculatus to enhance nutrition quality and the maintenance of high growth performance. Although A. caroliniana and L. minor may be used with culture media, L. minor provided best results for microalgae growth biomass and ornamental fish. Diet treatment with microalgae demonstrated that these mixed diets might be used as a new tool in the feeding of X. maculatus. Since no difference in feed conversion ratio has been observed between diet treatments, the above indicated that mixed and inert diets are similarly employed by fish to increase biomass. The production of low-cost food supplement from natural origin such as microalgae and macrophytes enhances future prospects capable of sustaining stocking density and high growth performance. The authors would like to thank FAPESP for funding (14/24697-3). Thanks are also due to CNPq for the scholarship awarded to the first (PQ II 305343/2014-9) and third (134543/2016-5) authors. The authors would like to thank the colleagues of the Ornamental Fish Laboratory. There is no conflict of interest between authors in the publication of this paper.